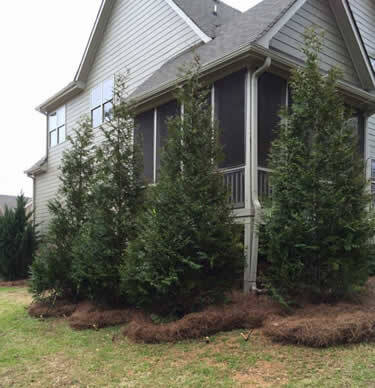 At our farm, we specialize in growing landscape and privacy trees in the Atlanta metro area. The varieties we grow on site are Murray Leyland Cypress, Leighton Green Leyland Cypress, Thuja Green Giant Arborvitae, Emerald Green Arborvitae and Yoshino Japanese Crytomeria. These are the only trees we specialize in here in, and we are one of the very few working tree farms that actually grows there trees here near Atlanta Georgia. Please take a look at each tree under the tab on our website for a full and complete description. If we do not grow what you’re looking for, we may still be able to locate it for you so please call us! We are tree growing experts, and have been in the business of growing cypress trees for decades. Our owner, Tim Keel, also grew up on a family farm in Lawrenceville, GA where his family still grows and sells trees to this day.